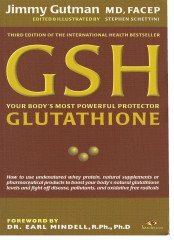 This is the list of books we highly recommend that you read as they are a comprehensive source of information on Glutathione (GSH) and immune health written by the doctors and researchers who are the internationally renowned experts on the topic. 1. "GLUTATHIONE (GSH). YOUR BODY'S MOST POWERFUL PROTECTOR" by Dr. Jimmy Gutman, MD, FACEP. Glutathione (GSH) is the body's most powerful protector and healing agent - much more than just another antioxidant. It also protects us prom bacteria, viruses, toxins, pollutants and even cancer. It maintains our immune system in tip-top shape - as long as our cells get the building blocks they need to produce this remarkable molecule. In this book, Dr. Jimmy Gutman explains why you need to raise your glutathione levels and how your immune system, antioxidant system and detoxification system all work together with glutathione to minimize the threats of disease, aging and environmental pollution. This book is written in easy to understand language for both medical professionals and the general public. It provides an overview of the role of glutathione in the body and thoroughly covers the role of glutathione in health and healing. The benefits of raised glutathione are discussed in the following medical conditions: cancer, aging, Parkinson's disease, Alzheimer's disease, heart disease, stroke and cholesterol, diabetes, liver diseases and hepatitis, AIDS, multiple sclerosis, lung diseases, digestive diseases, kidney failure and dialysis, eyes, ears, nose, throat and teeth diseases, pregnancy, lactation and childbirth, trauma and burns, psychoneurobiology, seizures, skin disorders, male health, and stress. Each chapter is accompanied by a list of references to the scientific research. "This book provides access to the cutting edge of one of todays' hottest research topics - glutathione in health and illness. Reading it will open a new world of discovery. I highly recommend this book to everyone from fellow researchers to those interested in improving their health" Dr. Jean Marcoux, MD, FRCP(C), Chairman, Advisory Board of the American Lung Association, Houston, TX. 2. "GLUTATHIONE. ITS ROLE IN CANCER & ANTICANCER THERAPY" by Dr. Jimmy Gutman, MD, FACEP. Why your body needs a regular supply of this critical substance and how it can help prevent the onset of cancer, and ease the side effects of chemotherapy and radiation therapy. 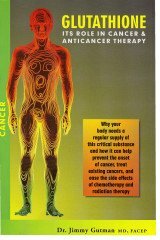 This brochure about glutathione concentrates on its role in the most feared of diseases - cancer. Here you will find a brief overview of glutathione, of cancer as a disease in general, its causes and connection to depleted glutathione levels, and you will find answers to many questions on how raising glutathione can help in both prevention and treatment of this disease. 3. 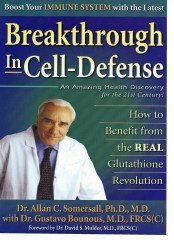 "BREAKTHROUGH IN CELL-DEFENSE" by Dr. Allan C. Somersall, PhD, MD, and Dr. Gustavo Bounous, MD, FRCS(C). Boost your immune system with the latest breakthrough in cell-defense. An amazing health discovery reveals how to benefit from the real glutathione revolution. This book is written to increase your knowledge of how to support the immune system... It makes a fascinating story. This book is a biography of Dr. Gustavo Bounous, the discoverer of immunoenhancing, glutathione raising properties of a simple substance - undenatured whey protein - which one day in the late 1970s was brought to Dr. Bounous's laboratory at McGill University for analysis as a by-product of cheese production. He discovered that undenatured whey protein can raise and maintain glutathione levels, safely and naturally, due to high bioavailable bonded cysteine and glutamylcysteine content in undenatured whey.